Save the environment & your wedding budget. Not sure what you're going to do with those 100 mason jars you picked up for your wedding??? We've got you covered! 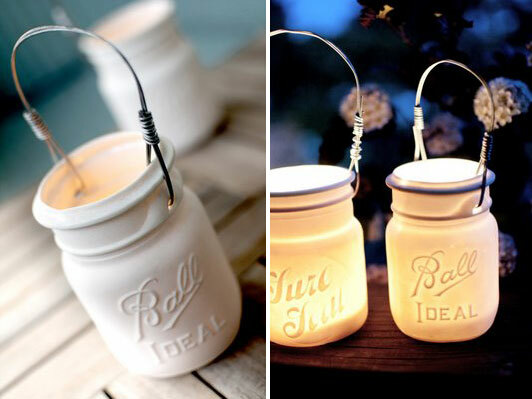 Glass jars are a wonderful blank canvas for the creative mind! With a vast reach from household decor to weddings, they can be perfect for every scene! Check out some of our favorite uses! Something old, new, borrowed & whatever color you'd like! =) You can use this technique with any glass container, so get creative. Mason jars, milk glasses, even votives and bowls! Sheryn will show you how to paint your own glasses Here. We love these bathroom organizers! Elegantly detailed, both beautiful and useful! Add a soft pop of color with glitter! Yes, I said it, GLITTER! Everything in moderation and that's no exception here! Just make sure you paint the side that will be dry so the water doesn't remove your new effect! And a shout out for our creative bakers out there, a new test on individuals deserts! For great recipes, check out our favorite baker and new blogger JEWELS. For the home. Though too crafty for an assortment of roses, this flower and twine look pairs perfectly with sprigs of wheat for a down home, country vibe! Outdoor lanterns, or with the same look..... Kitchen utensil storage. Install a set of simple coat hooks and hang the jars from the long arm.... You may need a longer wire for this depending on what you want to fill the jars with. Need some more jars? Put your friends and family on recycle alert and request that they save their spaghetti sauce jars for your upcoming project! Soak them in soapy warm water for a couple of hours and use a scour pad to remove the label. One run through the dishwasher and you have a shiny, label-less jar ready for decorating!